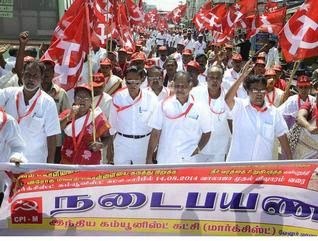 CPI (M) activists took out a 13-km march from Walajapet to Mel Visharam on Thursday, urging the government to protect the river Palar from sand-mining. Leading the march from Walajapet, G. Ramakrishnan, State secretary of the party, said that exploitation of sand deposits was rampant ever since the government began quarrying activities in the State in 2003. It was continuing unabated through successive the AIADMK and DMK regimes. “The Madras High Court ordered not to engage earth movers to scoop sand from rivers and restricted the miners from going beyond three feet deep. But they go even up to 30 feet deep. Politician-sand mafia nexus became so notorious that government officials and policemen who took action were attacked or killed. ” he said. The sand mafia not only exploits river sand but also exploits consumers by slapping exorbitant price on sand loads, Mr. Ramakrishnan said Addressing the volunteers participating in the march, N.Gunasekaran, State secretariat member of the party, said that five lakh families belonging to five districts including Vellore and Tiruvannamalai depend on the Palar for their livelihood. “However, the river is not merely a livelihood source; it is a historic monument; an identity of Tamil civilisation and pivot of its long culture. The government’s erroneous policy was responsible for the river’s present sorry state. The murder of police constable Kanagaraj while attempting to stop a vehicle from smuggling sand is a pointer to an impending disaster,” Mr.Gunasekaran observed. The marchers also wanted action against pollution of the Palar by industrial effluents and wanted eviction of encroachments from the river. A.Narayanan, district secretary of the party, Thinapuratchi, an activist of Joint Committee for Palar Protection and former MLA Hasan were among the participants.